Ravelry: Basic Black pattern by Glenna C.
Basic Black by Glenna C.
Originally published online in MagKnits. 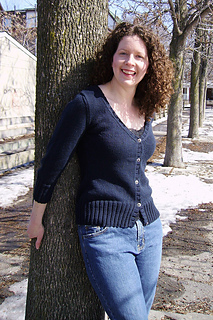 This is a basic stockinette v-neck cardigan with waist shaping and 3/4 sleeves. To add length to make this a good fit for lower rise jeans/pants, add 1-2 inches in even stockinette before starting the waist shaping decreases. Please note I am not able to guarantee pattern support for free patterns after their 1st year of release. This pattern was originally released in 2007. A word of warning - Plymouth Wildflower DK can be quite “splitty.” Some light-weight substitution candidates are Knitpicks Shine Sport, Rowan Wool Cotton, or Elann Luna. Virtually any DK-weight yarn may be substituted.